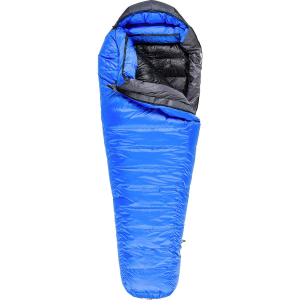 An excellent bag, and good to its rated temperature — MEC tries them out and checks! While a mummy bag might be cozier, I personally hate the feeling of being confined. I'm a side-sleeper so the extra room allows space to get my legs into a comfortable position. Nice big zippers and easy to open if it gets a bit warm in summer. The length is fine for me at 5'8" and there's room left over at the bottom if you want to snuggle down into it a bit. I've used this bag by itself, and also paired with a MEC Nomad synthetic rated for 0°C. 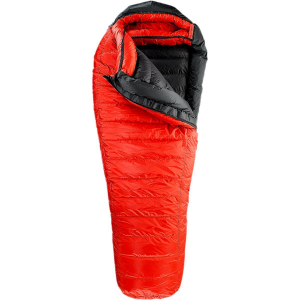 For two people, put the synthetic bag on the bottom in case of moisture and take advantage of the extra insulation offered by the Thermarest. Any two MEC barrel bags can be zipped together, and it's sure a lot cozier with two! No hood like a mummy bag, but wear a toque to bed, and you'll be fine. When it's gotten unexpectedly cold, though, I've pulled the top over my head and used the drawstring to create one. Also has a draft tube you can open up of you want. My favourite bag for dryer weather — not too hot in summer and good well into the shoulder seasons. I've had mine for three years now, using it pretty much every weekend through the summer, and it's still in great shape. This bag has been replaced for the upcoming year with the MEC Ziz, which includes a hood — that fixes one of the few complaints I've had about it. 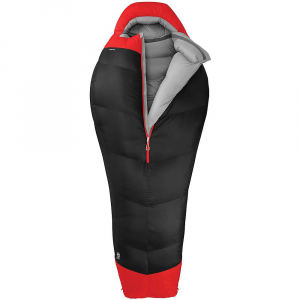 This a very roomy, warm sleeping bag. This bag is very roomy. I am 6'-0" and 190# and it feels great. I have some extra room to tug in and cover my head. 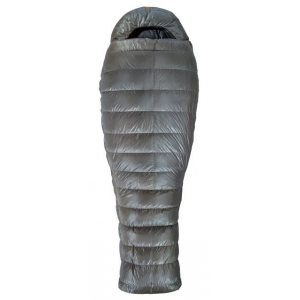 It is rated for -10°C but I think you can use it for serious winter camping f you had an inner liner. Why 4.5 and not 5.0? Well I would love if it had a hood, also it does take a little more room than I like on my backpack. MEC sells the Habanero, which is pretty much the same bag with hood but uses synthetic fill. I went with the Cygnet because Mother Nature is far better engineer than any guy at Dupont. Bonus points: You can pair this up with any other MEC bag if you like to camp with your significant other. Now my girlfriend is really tiny frame but there was plenty of room for two regular size persons. Summer. It is an overkill, but it does not roast you alive. It was quite a surprise. For really warm weather I would go with something lighter, but I will choose down again. Fall: Just perfect. You can manage your temperature just by adding a few extra layers. I am a warm sleeper and with just a T-shirt + shorts this last fall I had no problems. Winter: Not tried in serious winter yet (coming soon), but I went out early this November and paired it up with a MEC Drake (-0°C) and it was fine. OK, first night we ended up using an extra blanket but if you use the strings to seal it makes a hell of a difference.Also the other bag did not matched the rating of the Cygnet. First night was really cold, around -5°C ,but I would say that adding the wind chill -10° to -15°. Also we were sleeping in a three-season tent and it was very damp. We got rain and snow. Temperature during the entire weekend was around 0°C for sure. Pulling the strings to close the bag made all the difference the second night. Would I buy another: Yes. Would I recommend it to a friend: Yes. I think this baby can perform under very cold conditions if you do it smartly and without the nasty mummy bag dead corpse feeling. Thanks for the update, Luis. The Cygnet -10C has been discontinued. The MEC Cygnet -10C is not available from the stores we monitor.